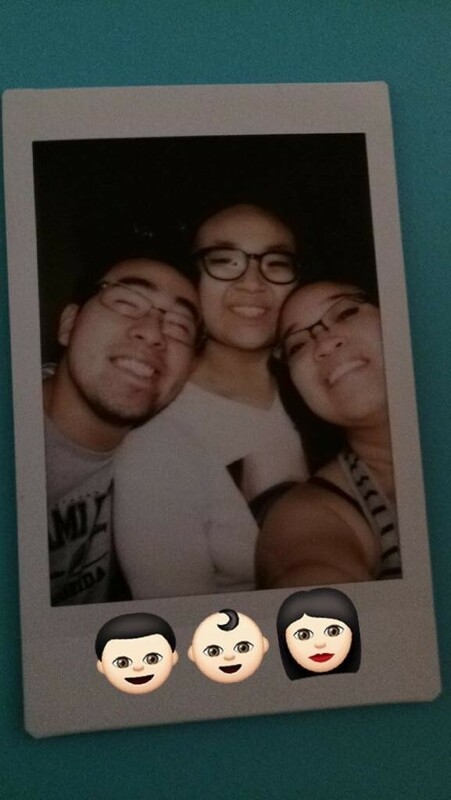 Hi everyone, my name is Christine Nguyen, this is a really hard story for me to share but my family is currently in need and I'm hoping this will be a start. March 3rd, 2015, was one of the most devastating days of my life. 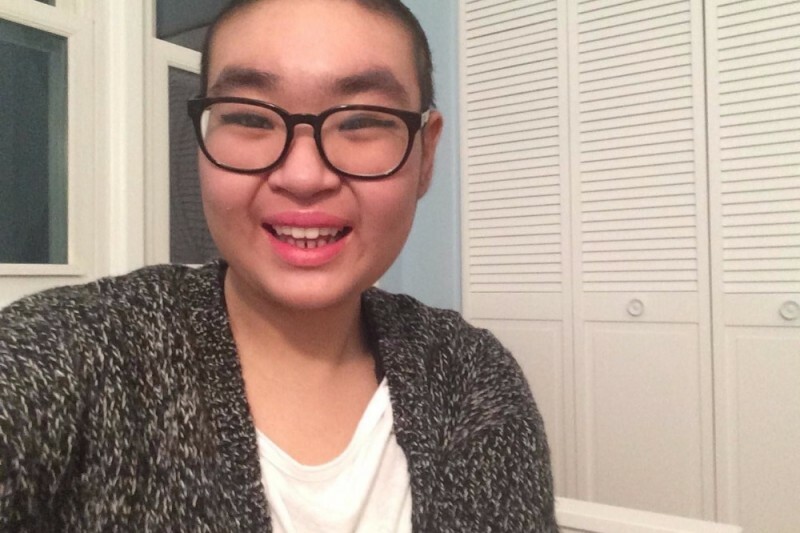 My 16 year old sister, Carly Nguyen, was diagnosed with Leukemia. She was diagnosed with a very rare form of Leukemia, Acute Myeloid Leukemia (M6) also known as "AML ". We were speechless. All we could do was cry. My sister, Carly, had been complaining to my parents the previous month that she wasn't feeling well, had no appetite, was always fatigued, and her face/lips got really pale. At first, my family thought that my sister was just coming down with a flu until one day she had gotten a really bad nosebleed that woudn't seem to stop. We went to the ER and hours later they were able to stop it. The follwing week, my parents made a sick appointment for my sister because she still wasn't feeling well. They checked her out and did some blood work. 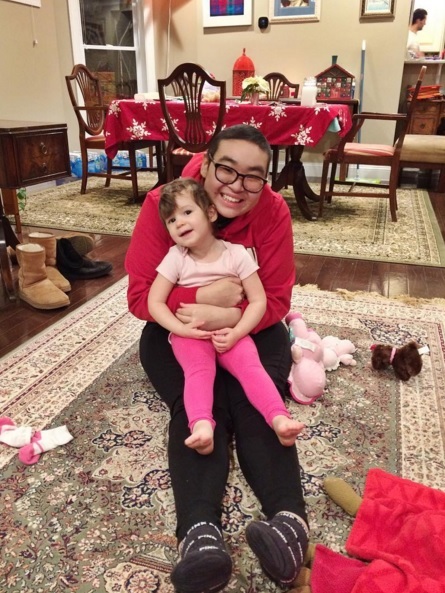 The next afternoon, my parents received an alarming call from my sister's pediatrician that we had to take her to the emergency room right away. We took her to the ER at Children's Hospital on Michigan Ave, NW, and after all the tests were done, they told us that she has leukemia. That same week, they did the bone marrow biopsy to determine the exact type of leukemia. She has AML M6 (Acute Myeloid Leukemia). The doctor said we brought her just in time. Because of these reasons, treatment started immediately after the diagnosis. That Friday, she had a broviac placed under the skin in her chest for the injection of the chemotherapy. They also had to remove one of her ovaries because chemotherapy can damage the immature eggs. This way they can freeze any eggs that they found for the future when she is cured from this illness, and would like to bear children, then there is the possibility that the remaining ovaries will produce fertile eggs. Either way, sadly, there is no guarantee. As for chemotherapy, there are 4 cycles of chemotherapy, each cycle lasting longer than a month, now including a bone marrow transplant . Carly had finished her first cycle in mid April. 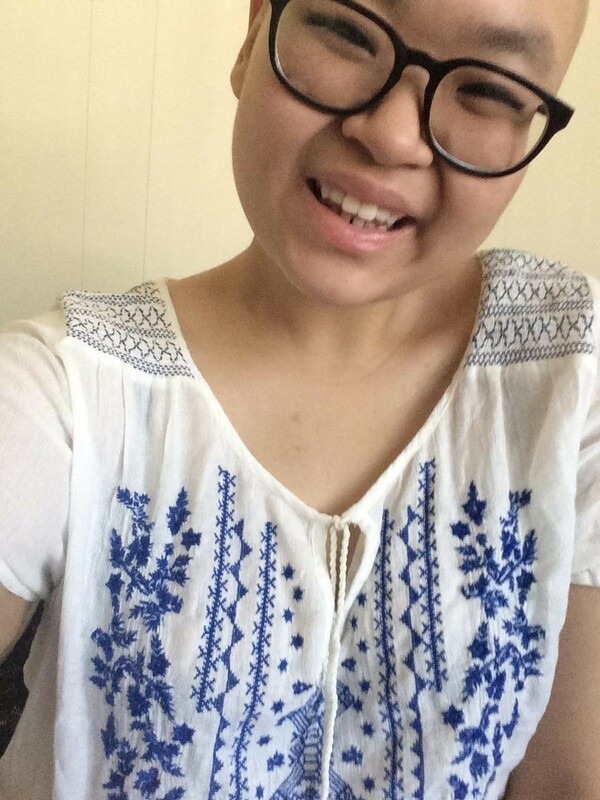 My sister did sadly lose her hair after the first few days of chemo, it was a really hard time for her because she had long, gorgeous hair. My sister did have a few side effects including: chills, fevers, and mouth sores. Unfortunately, after her first cycle of chemotherapy her first bone marrow biospy was questionable if all the cancer cells had been killed. She was required to have another bone marrow biospy which the doctors had confirmed there might still be some cancer cells in her bone marrow. We have now just completed the second cycle of chemotherapy and are waiting for the ANC (Absolute Neutrophil Count ) to come up before we can go into the next cycle. This second round, Carly experienced the same side effects but did have a reaction to a blood transfusion and got a bad rash and hives. She now has to be pre-medicated with about 4-5 medications before receiving any blood products which is common to keep her blood counts up. Unfortunately, with her induction (first) cycle coming back slightly positive, the doctors are now considering doing a Bone Marrow Transplant (BMT ). My family each did blood work to determine whether or not we would be a "perfect" match for my sister. Sadly, none of us were. We were extremely discouraged but now we are trying to bring awareness and encouraging others to become a Bone Marrow Donor . This is one of the most important things for my family right now because we have not found the "perfect" bone marrow match for my sister. This could save my sister's life and there is nothing else I want but that. Please consider visting BeTheMatch.org to become a donor, you can save my sister's life or another person's life. All it requires is a cheek swab to determine if you are a match for anyone, including my sister. The actual process of bone marrow donation is very similar to donating blood; it is simple and harmless. I believe that it is FREE for anyone between the ages of 18 and 44. Please consider saving someone's life by becoming a bone marrow donor! Besides, looking for a "perfect" match for my sister and having my sister even going through this is already hard enough but now my family is faced with this financial hardship. My mom was employed as a contractor for NASA Goddard Space Flight Center in Greenbelt for almost 25 years until they laid her off. Her unemployment has run out for a while now. She has now given up hope that her company will ever call her back. Even though, it seems like a blessing that she can be with my sister, but bills are never that kind. They keep coming. While insurance from my dad's job at the United States Post Office covers a decent amount of the expenses, there will still be significant hospital bills left to pay. We are extremely blessed that my sister is staying strong and grateful for all of the support she's received! Any help you can provide would be sincerely appreciated! I encourage everyone to also look into becoming a bone marrow donor as well on BeTheMatch.org . Please keep my sister Carly in your daily prayers. Thank you so much for your time and consderation. Whether or not you are able to donate or become a bone marrow donor, please consider spreading the word. Thank you. Here is a video of my sister's supportive high school dedicated a day in honor of Carly. It was "Orange" day to support show my sister as well as bringing awareness about Leukemia. THANK YOU MS. DAVEY, MRS. ROEDER, SISTER ELLEN MARIE, AND THE SETON COMMUNITY FOR ALL THAT YOU HAVE DONE! We hope that you all are doing well! We sincerely apologize for the lack of updates, but we are here today with a good one. Please forgive us, we are just trying to stay cautiously positive. We hope that everyone had a very happy and healthy holiday! It will be hard to remember every single update that has happened since the transplant day, but I will do my best to fill you in. As you may know, with a bone marrow transplant there are a lot of risks and concerns. Throughout the months of her body receiving and learning to accept the donor's bone marrow, Carly's body was facing a lot of different things. It's really scary to think about all side effects she had to go through including the risk of Graft vs Host Disease (GVHD). I must say that in this time period Carly was very uncomfortable with everything, including her face, lips, mouth (taste, too), hair (and no hair), tingling sensations, swelling, and unfortunately occasion fevers --the list goes on. From what I recall, one of the biggest (and long lasting) side effects was her mucositis. It got so bad that she couldn't eat or drink because she was in so much pain (and she lost her taste buds). Carly had to be on a very strict diet from the day of her transplant in August --only frozen foods, no take-out or restaurants, and no fruits or vegetables, especially not fresh. Some days her lips would just bleed or even stay stuck together. It was truly horrifying for all of us to see. Carly was so uncomfortable with everything and the way she looked that we didn't take pictures so we aren't able to show you how bad it was. As expected, it took a very long time for her counts to recover... We were just getting so anxious for the numbers to go up. Carly was never allowed to leave her room, every single item and person that stepped into the room had to be clean, the room was thoroughly cleaned everyday, bed changes every day - new sheets, pillow cases, and blankets everyday, everything had to washed every single day, showers every day, no one could sit on the bed with her or hug her.. and this list also goes on. I had lost count of the days. Once her counts had recovered, we finally got to go home. We were SO relieved and SO excited. Though we had frequent visits for Carly, we would rather be at home and visit, rather than just staying in the hospital. We were going in for a clinic visit and it was only 9 days after we got home, Carly was readmitted. It was a sad time for us. All our excitement had just gone away.. It started with a fever. They immediately gave her antibiotics, we thought it would be fine, until her blood pressure started dropping which is a sign of possible bacteria in the blood. We were rushed to the ER where they couldn't stabilize or up her blood pressure. They had to end up giving her a medication that caused her heart to race uncontrollably. You could see how hard and fast her pulse was racing through her neck. They were still unable to stabilize her blood pressure and we were sent to the PICU where we had to stay overnight and thankfully her blood pressure had stabilized. Carly had to get an incredible amount of blood work done to test for every bacteria, virus, everything possible. Days had past and tests were coming back negative... Even more days, maybe even weeks had passed, gratefully more negative results. The doctors were puzzled as to what had caused her fever and dropping of blood pressure. More days past... there were some other concerns but eventually we were released to go home. Thank God (and praying) that was the only time we had to be re-admitted. The next goal was to reach 100 days post transplant! 30 and 60 days after the transplant, Carly had get a bone marrow biopsy, lumbar puncture, and spinal tap. The most recent one was her day 100 procedure. With God's grace, Carly made it past day 100 with flying colors. God has been so good to us. He gave us all of you; all of your love, support, and prayers. He is healing Carly and gives her strength. He has blessed us with our family. He allowed Carly come home on my mom's birthday, graciously blessing my mom with another year too. Who do you think was there when Carly got better but the doctor's didn't know what caused it? That was God. Who do you think was there when Carly's bone marrow requirements changed yet there was miraculously a new donor that met that requirement? That was God. I will give Him all the praise and glory for blessing my family during one of the hardest times of our lives. By God's grace Carly is still here, she's being healed by our Lord almighty, and she's thriving... and she has had cleared/ negative results thus far; SHE IS CLEARED. (Please remember we are staying CAUTIOUSLY positive.) And Lord, we will continue to pray everyday that it stays that way! My heart is wholeheartedly full. There are no words to thank God and all of you for EVERYTHING you have done. We thank God for sending us Carly's bone marrow donor; for his kindness and generosity, we hope we can thank him in person one day. We thank all of you for constantly thinking of us, praying for us, taking your time to prepare meals for us, and supporting us -and thank you to those who took time to come visit us, too. You all have shown unconditional love and it is always known. We wish we could pay you all back for everything you have done for us. I wish I could find the words (and the time) to thank each and every one of you. With the new year, I pray that God blesses all of you and continues to bless us with health, happiness, strength, and His love. Thank you for supporting my sister through her journey. Thank you for supporting my family in these times. Thank you for everything. We still have a long road of recovery but we are truly thankful for how she's doing right now! PS: One of the most exciting things Carly has gotten to do since all of this happened, was to come back to school and see the school's Christmas show. What an amazing school she has.. They never fail to show Carly how special and loved she is. It was a last minute decision after we got approval from the doctor if Carly could go to school for this event. We told Mrs. Davey-Landini 8 o'clock the night before the show. When we arrived, we were greeted with so much enthusiasm and even front row seats! The staff at Elizabeth Seton HS had put up such an amazing show. As they counted the 12 Days of Christmas (Seton Style), they reached day 12, which was 12 Seniors Fighting. It was a silly scene of the teachers fighting over a guy with the fight song, and all of a sudden he comes off stage and brings Carly on stage. It was amazing. They sang Fight Song all on stage together. It was unexpected, but truly beautiful. We're so thankful for Elizabeth Seton HS, such a beautiful school filled with beautiful people. We're so lucky to have each and every one of you supporting us, and let me tell you how great that school is! Our support, love, and prayers even expand out of the Seton community through their families, friends, and Seton alumni. My family and I are filled with gratitude for everything everyone has done for us. We are sending you lots of love from us to you! Thank you. 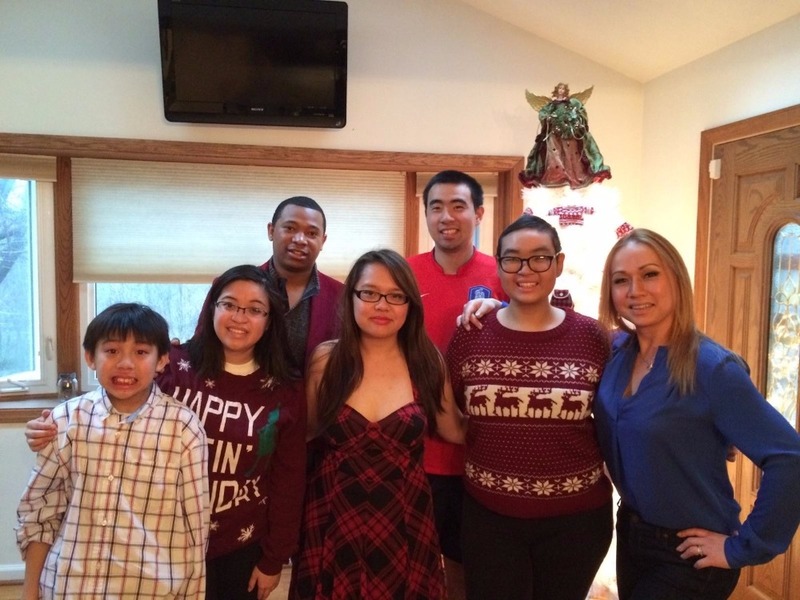 Some of our family & Carly at Christmas! Today my sister, Carly, received a bone marrow transplant. We have been anticipating this day for months. It is one of the biggest days of her life. 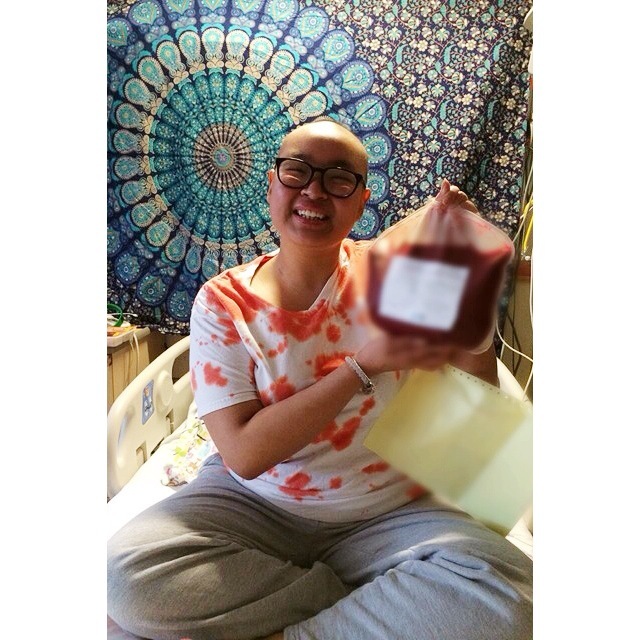 God bless the donor who was gracious enough to donate over 1 liter of bone marrow to help save my sister's life. We are eternally thankful and will treasure this gift of life forever. We're praying for a successful recovery where she will finally be cured and we can meet the donor. All Glory goes to God as He was with her today. We thank God the transplant went smoothly. Now she is officially on the road to recovery. The first week will be the roughest, but with our continuous faith and our faithful God, it will only get better. She is one of the strongest persons I know. She is a FIGHTER! The transplant started at 1:35pm this afternoon, and finally finished this evening at 7:59pm. After a long six hours and thirty-four minutes, it is complete! May God continue to bless my sister and her bone marrow. Thank you so much to every single person for their positive thoughts, support, and endless prayers. Carly had a rough week this week. She has a bunch of antibiotics, handful of other medications, endless bags of IV fluids, a ton of blood products, and extremely strong chemo. She was not eating this past week so they had to put in a feeding tube for her so she can get enough nutrition before the "big day". Her mucusitis is starting to line her mouth, throat, and gut. She was feeling nauseous and was so weak that she could not get out of bed. (That's not Carly at all)! But today it will get better. Please continue to keep my sister in your prayers! We are confident that God will keep her in His arms, give her strength through this, and heal her of this horrendous disease. We are praying for a successful transplant and pray she will finally be cured. Your endless prayers and support have helped keep her spirits up and ours as well. We're forever grateful for all of you. Thank you all for your continuous support and generosity. Thank you to everyone who has been kind enough to donate to my sister's funds and those who are kind enough to help us with other things. Thank you to everyone for your prayers and your support. It means the world to us, and we are so grateful to have such a supportive community of friends and family, both in person and via social networks! 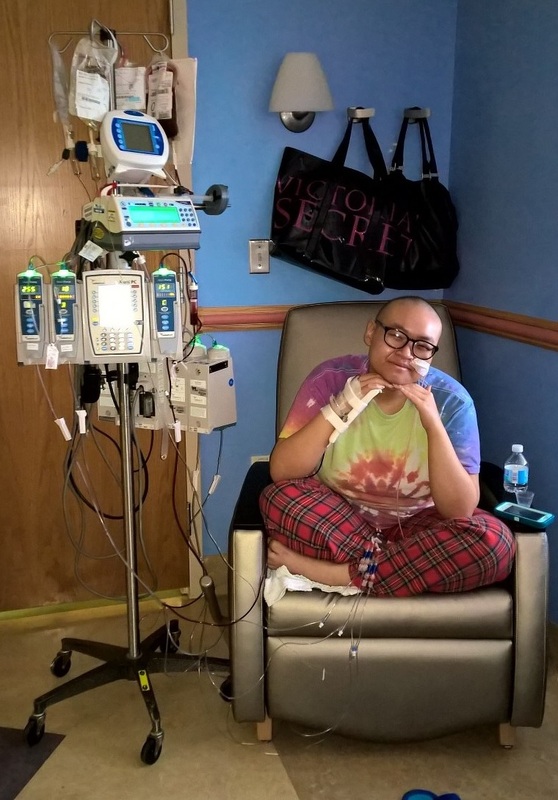 Carly has completed her third round of chemo. As some of you know, she had her bone marrow biopsy and lumbar puncture at the end of her chemo and the the results were cleared! All Glory to God! Since then, we've been preparing for BMT. BMT has a lot of very strict rules and we've been making sure we're doing our best to protect Carly from any bad bacteria, germs, dirt, or anything that may affect her immune system. While in BMT, she is in complete isolation. My sister was admitted into the BMT unit this past Monday. Her first day of radiation started on Tuesday and is done for four days, twice a day. She's had some nausea the past couple days from radiation, but she is a champion! She's had some darkened on her skin from the radiation and it makes her really tired, but she is doing well otherwise. Thankfully, today was the last day of radiation but sadly, it doesn't end there because she will start new chemo tomorrow for five days. The "big day" for her Bone Marrow Transplant is in exactly one week. August 28th. I would greatly appreciate if you could please keep my sister in your prayers during this time. Unfortunately, she still does not have a perfect match but the doctors have agreed that there was a donor who they feel is a good match. She will be getting her bone marrow transplant from an Unrelated Donor who is considered a "close" match. We pray that, though they are not a perfect match, they will be perfect (or the best) for her. She's already on so much medication and the list will only get bigger because she has a little to no immune system as she her body tries to accept the new bone marrow. There are a lot of risks, but we are very hopeful and positive. Recovery is going to be the hardest part. We want to thank everyone for being with us as we go through this. And we would like to thank the donor as well. Please continue to pray for my sister. Thank you for your time. Thanks for the update Christine! I love the pictures. I am continuing to pray for you. Hang in there! Hi Christine, my name is Nadya Dutchin and I work for Be The Match; the national bone marrow registry. Please feel free to contact me so that we can talk with your family about Carly's treatment and provide the support that all of you need right now. We also have local Reps who would be happy to help you organize bone marrow drive events. You can reach me directly at ndutchin@nmdp.org or 443-472-1446. We're here to help and support Carly and your family, so please don't hesitate to reach out when you can. Winston Churchill once said "when you are going through Hell, keep going." Keep going, Carly!